As the bright Riviera sun was shining down on Cannes last Wednesday evening, photographers and onlookers swarmed the steps of the Palais des Festivals. The festival’s principle jury, which included Jessica Chastain, Maren Ade, Will Smith and Pedro Almodovar (the jury’s president), slowly ascended the stairs and entered the Palais for the opening night ceremony. And with that, the 70th annual Cannes Film Festival had officially begun. This is the first report in what will be a series of three, each of which will cover roughly 10 movies viewed at the 2017 Cannes Film Festival. The festival lurched ungracefully out of the starting gate with Arnaud Desplechin’s Ismael’s Ghosts, the opening night film. The undecipherable plot has something to do with Ismael (Mathieu Amalric, hammy as ever), a filmmaker whose wife (Marion Cotillard) mysteriously returns after having disappeared years earlier. This return upsets the filmmaker’s new girlfriend (Charlotte Gainsbourg). Mixed into the fray are scenes from the espionage thriller Ismael is filming. Ismael’s Ghosts is all over the place. The scenes jarringly change plot and tone, abandoning one idea to wander to another. Cotillard’s mysterious past becomes irrelevant, as does the relationship between Ismael and his girlfriend. By the end, Ismael’s Ghosts has become about Ismael’s ridiculous breakdown brought on by his new film, but by the end you’ll have given up on the film’s having anything coherent to say. There are plenty of great films with messy, sprawling plots, but Ismael’s Ghosts has no central idea or aesthetic world to tie together all of these disparate vignettes, and the film is tedious as a result. Opening the Director’s Fortnight section of the Cannes Film Festival was Claire Denis’ Un Beau Soleil Interieur. Starring the perpetually dependable Juliette Binoche, Un Beau Soleil Interieur follows Isabelle’s (Binoche) relationships with her various romantic partners, none of which coagulate into the great romantic ideal after which she so ardently pines. Un Beau Soleil Interieur exhibits a classic French sensibility as Isabelle and her lovers constantly converse - in bars and in bedrooms - about the nature of their relationships. Denis films these interactions in close, intimate two-shots, allowing us to see the calculation on the characters’ faces as they play the manipulative, self-serving games that people in romantic relationships inevitably play with one another. Though the film drags towards the end (as Gerard Depardieu appears out of nowhere), Un Beau Soleil Interieur is a funny, well-observed tale of a determined middle-aged woman’s unquenched desire for a greedy sort of love. Also debuting on the first day of the competition, Todd Haynes’ Wonderstruck is filled with a sweetness that was welcomed after the brutal, brilliant bitterness of Loveless. Wonderstruck tells the story of Ben (Oakes Fegley), a young boy who, after losing his hearing when struck by lightning, sets out in search of the father he never knew. The pacing of this film feels off - intercut stories (one in the '70s and one in the '20s) both feel a little lugubrious during the middle of the film, even if the convergence of those two stories picks up in quality towards the end, both in terms of storytelling and pathos. Visually, Haynes brings his usual soft touch; the warm tones of the visuals match the love that friends and family alike demonstrate towards one another in Wonderstruck’s whimsical world. The following day, the competition featured Kornel Mundruczo’s Jupiter’s Moon, a film that remains the competition’s most politically charged film. At the beginning of the director’s follow up to 2014’s White God, a young Syrian refugee is shot in cold blood by a Hungarian police officer as he tries to cross the Hungarian boarder. Mysteriously, the shots do not kill Aryan Dashni (Zsombor Jeger) but rather give him the ability to levitate. This supernatural skill is discovered by Dr. Stern (an excellent Merab Ninidze), a deeply cynical man who, though he develops a friendship with Aryan, nevertheless exploits his ability to levitate for financial gain. And all the while, the sinister cop who shot Aryan follows the duo around Budapest in a vengeful effort to hide his misconduct in shooting the young man. Jupiter’s Moon is an intense viewing experience from beginning to end, an atmosphere created by the harshness of Hungary’s political situation, the air of menace and mystery that hangs about the film, and Mundruczo’s smoggy, obscuring visual style. Jupiter’s Moon may not be entirely consistent in tone, but it’s nevertheless a stunning cinematic experience. Next in competition was Bong Joon-ho’s Netflix-produced sci-fi creature feature (where the creatures are good), Okja. The film begins with Lucy Mirando (Tilda Swinton), of the Mirando Corporation, energetically announcing at a heavily publicised event that her business has found a miracle pig that can be raised without GMO’s to end world hunger. 10 years later, we see that one of those mutant pigs is living on a remote mountain farm in South Korea as the beloved pet of the young Mija (a plucky An Seo Hyun). When the Mirando Corporation comes to reclaim the pig with sinister intent, Mija, along with a militant animal rights group, won’t let Okja go without a fight. 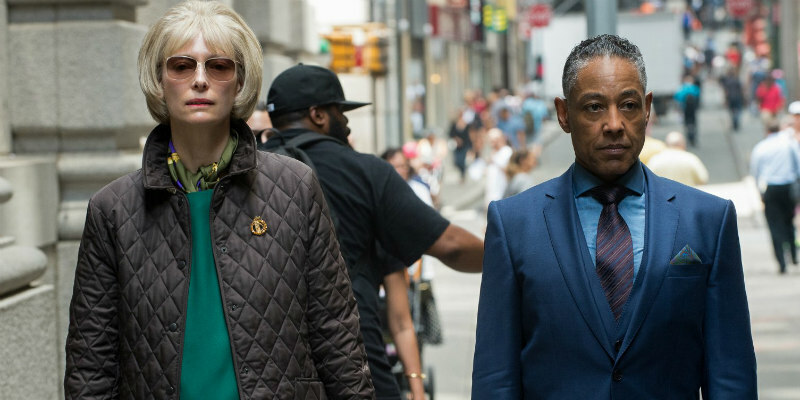 Okja is often hit-or-miss: some of the comedy/action contains Bong’s characteristic wit and bounce, like when the pig is turned loose in a shopping mall. Some of it, however, feels miscalibrated, like Jake Gyllenhaal’s bizarre goofy performance as the celebrity face of the Mirando Corporation. Still, if you’re not a vegetarian (like me) then Okja will give you a lot to think about, and that may ultimately be its best virtue. Playing out of competition in the official selection was the documentary Faces/Places, a collaborative effort from the legendary French New Wave icon Agnes Varda and young French street artist JR. In this gentle, funny meta-doc, we follow Varda and JR as they go to different French villages and erect imaginative street art representing the people they meet along the way. The happiest of odd-couples, Varda’s tiny trim frame pairs humorously with JR’s lanky nimbleness - a difference the film seems conscious of as soon as the opening credits roll. But though they’re physically different, the two are both happily quick to celebrate humanity in all its forms - probing people to figure out what kind of project they should do in a given village, and then asking those same people their opinion of the piece once it’s completed. Faces/Places goes beyond simply depicting this artistic process however; Varda and JR create their own delicately poignant narrative of debate and camaraderie between themselves, and the film has some cool French New Wave throwbacks as well. The cult director Abel Ferrara released a similar sort of autobiographical documentary with Alive in France, which was screened as part of the Director’s Fortnight. Though not nearly as profound or experimental as Faces/Places, Alive in France is a buoyant concert film as Ferrara and his longtime friends/collaborators put together different sets. Though Ferrara himself, who charmingly lumbers around French sidewalks good-naturedly spewing vulgarisms like a possessed scarecrow, is both funny and life affirming in his caustic ramblings, the real reason to watch Alive in France is the music, which blends jazz, blues, funk, and punk in great ways. Also from The Director’s Fortnight was Chloe Zhao’s sophomore feature, The Rider, a film set in a sparsely populated part of the Western United States. Using a nearly completely non-professional cast, Zhao was able to draw astounding performances from her actors as they told a story of the danger, excitement, and pain involved in participating in rodeos. In her spare but human drama, Zhao beautifully shows how uneducated young men with little professional opportunities destroy themselves physically and emotionally in rodeos - an outlet that lets them feel accomplished and a part of something special. Some scenes are devastatingly effective in the quiet simplicity with which Zhao represents the dignity of one character in particular - Brady (Brady Jandreau). Even if The Rider is too long and ruins some moments with terribly on-the-nose monologues about ideas that were already perfectly implicit, it’s a film worth seeking out because of the emotional subtlety with which it treats people who are often caricaturised or ignored altogether. The first few days of in-competition movies wrapped up with The Square, Swedish director Ruben Ostlund’s follow up to his successful tragicomedy Force Majeure (2014). But watching Force Majeure cannot adequately prepare you for this 2.5 hour-long epic of surrealist modern art satire. Almost more of an art installation itself than a narrative, The Square primarily follows the museum’s lanky curator Christian (a wonderfully droll Claes Bang) as he finds himself in a series of chaotic situations that run hilariously counter with his unstudied complacency. But this description does not do the film justice - The Square is an unclassifiable epic of the bizarre that, after its parade of grotesqueries (presented in Ostlund’s dead-pan matter-of-fact style) has ended, will linger in your mind with a sense of aesthetic satisfaction. In the next report, we’ll take a look at Michel Hazanavicius’ Godard biopic, Michael Haneke’s newest exploration into upper class perversity, Yorgos Lanthimos’ new horror film, Hong Sang-soo’s latest comedy/drama, and much, much more. Stay tuned!